CBET certification is recognized as a demonstration of competence for BMETs working in the HTM field. Certification through the AAMI Certification Institute (ACI) is approved by the American National Standards Institute (ANSI). 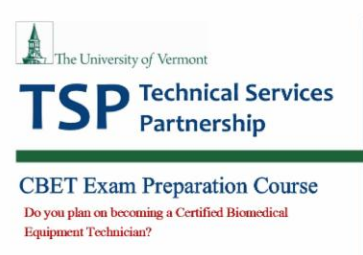 The Technical Services Partnership at the University of Vermont (UVM) will again be offering the CBET Examination Review Course nationally starting in February . The course is set to begin Thursday, February 16 with one-hour webinar review sessions each week for 11 weeks. The topics mirror those in the ACI CBET Certification Candidate Handbook. Material is provided weekly in advance for review with the final session being an all-day class held both live and online interactively. Go to the TSPCertNOW! Website for more information and to register. Group discounts are available. Course registration also entitles you to a 10 percent discount on the AAMI BMET Study Guide (2015). The Technical Services Partnership at UVM is a nationally recognized healthcare technology management shared service formed in 1973 providing support for hospitals in Vermont, New York and New Hampshire. Certified staff have grown from 15 to 70 percent recently with certifications including CBET, CRES, CHTM and CCE. The CBET review course developed by faculty and staff at UVM has been used internally resulting in 19 of 19 BMET staff passing the CBET exam over the past 18 months. The program and its success was published in the AAMI Biomedical Instrumentation & Technology article in the September/October 2016 column Bright Ideas: To Be the Best, Department Starts ‘Cert Now!’. 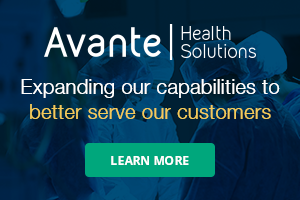 The Technical Services Partnership has been selected to publish eight Bright Ideas and Best Practice case studies in the AAMI publication Biomedical Instrumentation & Technology and is a World Health Organization Collaborating Center for Healthcare Technology Management.